The Snoqualmie Valley is an incredibly beautiful place with vast farmlands, historic downtowns, lush forests, and rugged mountains. This itinerary will take you on a scenic journey from agriculture to alpine, from Main Street to mountain, leaving you refreshed and inspired. The total trip is 90 miles and about two-hours of drive time, but with stops and walks along the way, this is a great way to spend a day! Start your day in Downtown Duvall, a fun, arts-inspired town. Grab a warm beverage from one of the local coffee houses and enjoy a walk down main street, taking in the public art and local shops. Next, head west on the Woodinville-Duvall road. 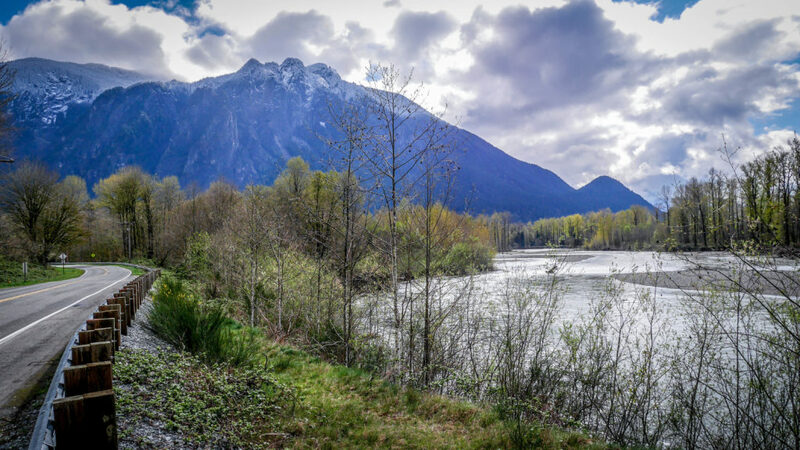 Drive over the Snoqualmie River and past farm fields, then take a left onto the West Snoqualmie Valley Road, a beautiful and historic corridor. Take in the gorgeous scenery as the road winds past farm fields and through a tunnel of trees. This drive is particularly beautiful in the fall when the Big-leaf maples show off their golden leaves. Continue south on West Snoqualmie Valley Road for about 6 miles then take a left onto NE 80th Street, followed by another left onto Ames Lake-Carnation Rd NE. This road will take you to Carnation Farm Road and through the historic Carnation Farms. Look out for the statue of their famous cow “Possum Sweetheart”. The cow statue can make for a fun photo op. You can read more about its international fame here. If you are visiting in the summer or fall, you can also check out their farmstand stocked with Valley-grown produce. Continue on the Carnation Farm Road for two miles to Highway 203. Take a right and head into Downtown Carnation. Find a spot to park and take a break to enjoy this fun farm town. Stroll down main street and peruse the shops. Tolt Yarn and Wool is a particular favorite, and is known by knitters across the world. You can also take a little side trip into Tolt MacDonald Park. Just walk west on Entwistle Road and you will hit a trail that leads into the park. This 574-acre park has lots of fun features, including the 500-foot suspension bridge that spans the Snoqualmie River. After enjoying Carnation, get back into your car and continue heading south on Highway 203. Drive for about 6 miles until you get to a roundabout. Take the first exit off the roundabout where you’ll arrive in downtown Fall City. Find a spot to park, then enjoy the self-guided Fall City Historic Signs Tour. You can download the map here. After your stroll head back to the roundabout and take the first exit to stay on Highway 202. Enjoy peak-a-boo views of the Snoqualmie River, as you head upstream. After 4 miles you will see the Snoqualmie Falls Park, famous for its 268-foot waterfall. Continuing south on Highway 202 you will quickly arrive at another roundabout. Take the second exit to get onto the SE Mill Pond Road. This winding road will take you past the historic Snoqualmie Mill and associated Pond. The lake that you will see on your left is Lake Borst, better known to locals as the Mill Pond. It was used first by the Snoqualmie Mill in the late 1800s, in the 1910s-1990s it was used by Weyerhaeuser’s Snoqualmie Falls Lumber Co Mill. Formed out of an oxbow in the Snoqualmie River, it features an island in the middle. Continuing past the Lake you will quickly reach SE Reinig Rd. Take a left onto Reinig road and enjoy another beautiful byway. This road is known for its Sycamore Corridor. In 1925, the Snoqualmie Falls Lumber Company planted one sycamore tree in front of each mill house in what was known as the Riverside Neighborhood of the mill town of Snoqualmie Falls. In the 1950s all the houses were moved to other places in the Valley, leaving the as the only remaining remnants of the lost town of Snoqualmie Falls. You may also know of this road, from the T.V. series “Twin Peaks”, which used a view of this road as its iconic opening mountain shot. Continue on Reinig for a couple of miles until you arrive at a “T”. Take a right onto 428th Ave SE and cross the Middle Fork Snoqualmie River. Continue south, following the flow of the road, which will take you onto SE 108th St. and then onto Ballarat Ave NE and into the North Bend Landmark District. Park and stretch your legs for a bit and take in this lovely downtown. Grab a coffee or some lunch at any number of spots while you enjoy the looming Mount Si. Once your legs are stretched and your body refueled, head west on North Bend Way, then take a left onto Bendigo Blvd to get to I-90. Head east on I-90 and enjoy the impressive mountains that surround you on all sides. Continue east until you reach Snoqualmie Pass and take exit 52. Take a left off the exit, then another left onto NF-58. This curving road, winds next to the South Fork of the Snoqualmie River and through beautiful stretches of forest. Continue heading west for about ten minutes, then take a right at the “T” onto NF-9034 Rd then a left onto NF-55 road. At the next “T” take a left onto Asahel Curtis Road*, which will lead you to a parking area for the Asahel Picnic Area and Nature Trail. This short loop trail is great for kids, or anyone looking for an relaxed nature walk. Enjoy the towering old growth forest and read about various plant species as you enjoy this interpretive hike. *This road may not be accessible in winter, but you can park at the bottom and walk up the road to the trailhead. After your refreshing walk, head back to I-90. Head west on I-90 to exit 31. Take a right off of the interstate and follow Bendigo Blvd S to head toward the Snoqualmie Landmark District. After about a mile you will pass by the historic Tollgate and Meadowbrook Farms. These farms are historically significant and continue to be cornerstones for the community. Continue another couple miles to downtown Snoqualmie and complete your day by enjoying some good food while you reflect on your journey through the Valley.